It’s funny how our sense of time is so malleable. When there is a time change and I look at a clock that hasn’t been updated, it’s easy to believe that it’s an hour earlier or later than reality. A clock has to be off by 5 or 6 hours for it to be obviously wrong to me. I guess when you spend most of your time indoors under unchanging lighting, the clock is your only guide. Also, things to write on and mail to other people are available now! 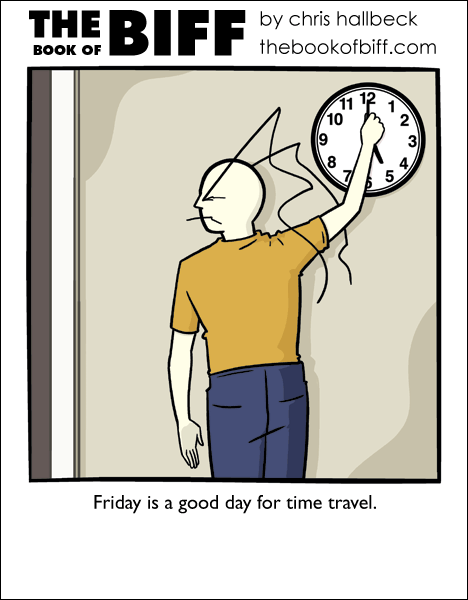 Looks like Biff will be time traveling with his co-workers…cuz nobody is stayin’ on a Friday, the clock rules! Arugh! We are ruled by the network computer clock. Does Biff do I.T.? A year was far longer when I was younger, and now that I’m older, they go by far too quickly. Where’s that middle ground? If only that worked in real life. Happy Friday the Thirteenth everyone! A year is quickly over. But a day can last so long! Many people ‘flex work’ on Fridays ’round here. That’s when I get my best work done – it feels like I’m working on a Saturday – with another work-free saturday coming right behind it! If only it worked like that on my old job… we were ruled by a bell set up on an internal clock. So no matter what you did to the clocks on the line, it wasn’t time to leave ’till that last bell rang. This made me laugh because I felt like I had successfully went back in time when I set my clock back this year. @Hershey – Each reader gets one per year, congrats! baughbe: I think Biff is an engineer. Civil engineer or architect, I think. Silly Biff, time travel is only possible through the internet, ( or vacuum cleaners) not a clock :D.
Win win win win win win win. I don’t usually take the time to notice the time change since I time travel most of the time anyhow. remember the time a few comics back when he used a compass (the kind with a needle on one point and a pencil on the other) as a slingshot to send email? what job could he have where he would have one lying around? Wouldn’t any day be good for time travel? Really you could just travel to friday, right? I remember how I was an intern at a print shop for the school district I was in (I was held back for 3 years in 12th grade) and an hour would go by fast. Too fast to me…But I guess it was only one hour. You seek knowledge of time travel? Prepare for your first lesson. Ha ha ha! *Ahahahnosseltsrifrouyroferaperp! * You seek knowledge of time travel?